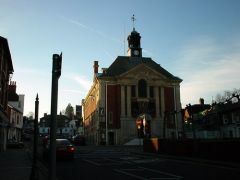 The front of Henley's large and impressive Town Hall taken from the pedestrianised Market Place. 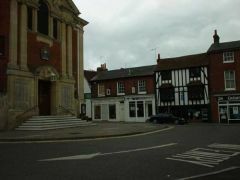 The front of the Town Hall situated within Market Place. In the background are a few shops and Uncle Sam's restaurant. 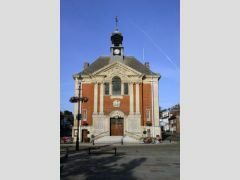 This town hall built in 1901 replaced the old town hall that was taken down in 1898 and re-erected on Crazies Hill as a private home.